Transfer the dough baby to a lightly oiled bowl, cover it with plastic wrap and let it rise. Start watching the film Forrest Gump. When the movie is over, the dough should be ready for the next step. Kiss your fists and punch the dough down and chant a mantra that makes you feel good. Place the dough on a lightly floured surface, and divide the dough into 6 pieces (or more, for smaller bagels). Roll each into a sausage shape about 6 inches long. Join the ends to form a circle. Repeat with the remaining dough, and let the bagels rest for 15 minutes. Preheat your favorite oven to 475 degrees F (245 degrees C). Line a baking sheet with parchment paper. Arrange small plates with poppy seeds, sesame seeds, frosted flakes, fruity pebbles and onion flakes next to the baking sheet if you’re feeling fancy. Bring 4 quarts water to a boil in a large pot. Add honey, if desired. Boil the bagels, three at a time, until they rise to the surface of the pot, about 1 minute per side. Remove the bagels with a spoon and place them on a parchment-lined baking sheet. Dip the tops of the wet bagels into the toppings and arrange them, seeds and cereal up, on the baking sheet. 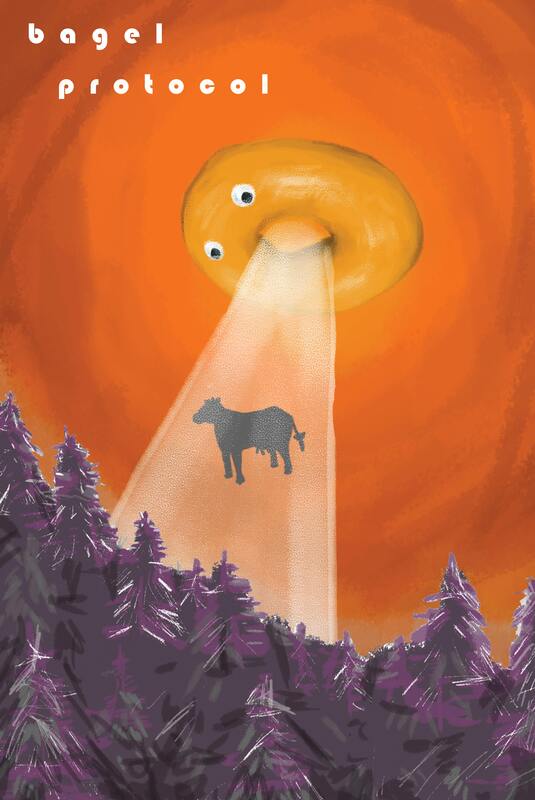 Make a circle with your hands, close your eyes and imagine your soul being incarnated as a bagel on a table. Sprinkle bagels with coarse salt, if desired. Bake in the preheated oven until the bagels begin to brown, 15 to 20 minutes. BN: How long have you been selling bagels out of your van? Bob: 75 years. Everyone loves bagels. Is it true people used to call you the bagel wizard? That’s the name they gave me on the street. I used to have a long white beard and elegant robes. Now I’m a lot more low key and keep my identity private. Have you thought about starting a food truck? Yes, but I like my van. I’ve got 420 different vans on my property in east Texas. Had to build a parking lot next to the bagel storage facility. The best way to travel across America is in a van, filled with bagels. Can you smell them? Yes, the smell is intoxicating. Where did you start? That information is classified. Next question please. How many bagels have you sold? About forty two hundred million around the world. I offer 30 different flavors of cream cheese. I reckon that’s why people keep coming back for more. Once you begin going down the rabbit hole of combining different cream cheese flavors with various variaties of bagels it’ll make functioning in the real world very difficult. Overtime I slowly learned how to quantum shift into other dimensions and be conscious of multiple realities at once. This allows me to sell bagels with maximum efficiency to a lot of people simultaneously. No further questions please, I have customers waiting.